Threads of Passion - a Raspberry-Peach Fruit Loaf! 1/2 cup semi-sweet chocolate chips or a semi-sweet chocolate bar cut to 1/4" (1/2 cm) wide - do NOT combine with any ingredients. The chocolate is added only at assembly. Remove the stones from the 4 peaches and, leaving the skin on, pulse them in your food processor, maybe 6 to 10 times - just until they are a chunky puree - and set it aside for later use. 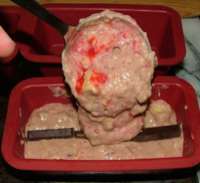 Break up the balance of the raspberries (3 tablespoons - frozen [freeze the berries if necessary]) with the potato masher. This will break them into their aggregates without damaging the fruit. Stir these into the raspberrry puree and set it aside for later use. Stir in the diced peach pieces until they are fully coated in the dry ingredients - taking care not to crush or othewise damage the fruit pieces. Add the raspberry puree stirring gently JUST until the raspberry puree is swirled in. With the ladel or spoon put a thin layer (about 1/2" [1.5 cm] deep) into a loaf pan. Carefully lay down a continuous strand of chocolate. Ladel or spoon in about 3/4 to 1" (2 to 2.5 cm) of batter. Carefully lay down another continuous strand of chocolate. Top up with another inch (2.5 cm of batter) - should almost fill the mini-loaf pan. Complete these steps with the other 3 mini-loaf pans and place all pans on the cookie sheet. Place sheet with loaf pans in the middle of the oven and bake for 30 minutes or until the loaves toothpick test as done. This recipe makes a bit too much batter for 4 mini-loaves. Use the excess/leftover batter to make a couple of Passion's Roses. If your passion demands it, you can try laying down a third strand of chocolate! This recipe may be split with the Passion's Rose recipe. Fill the desired number of loaf pans first, then fill muffin cups with no chocolate for a portion of Passion's Rose (Remember, muffins cook faster than loaves). About "toothpick" testing for doneness: Insert the toothpick into the center of the loaf. If the toothpick comes out wet return these quick breads to the oven for 2 to 4 minutes. You may see some grains sticking to the toothpick. If they are dry your loaves are done - some sticking, of cooked dough, to the toothpick is normal. If (batter-like) wet bits stick to the toothpick continue baking your loaves. Threads of Passion is a mini-loaf so named because as we were creating this all we could think was of our significant others and the passions they aroused within us. It is, in fact, basically a fruit loaf with peaches and raspberries ... a delightful combination! 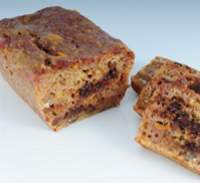 This fruit loaf uses purees of fruit as well as chunks. Some would advocate removing the rasberry seeds but, to us, all the elements within this marvelous dessert loaf are representative. Love is sweet and sometimes tart. Sometimes it's a little seedy but always - it's a little nutty ... and, invariable, there are some surprises within it. In this case the surprise would be threads of chocolate running the length of the loaf. The Oregon Raspberry & Blackberry Commission, in studies on nutraceutical properties of caneberry seed oils (oils from the seeds of fruits, such as raspberries and blackberries, which grow on canes) concluded that the oils of these berry seeds contain the much vaunted omega-3 fatty oils in addition to other healthy elements we seek in our contemporary diets. It has even been suggested that these caneberry oils may, some day, make it to market as high quality cooking oils. There are, in other words, more reasons to keep the seeds in than to expel them as some may choose. This loaf was created during peach season - peaches, coming directly after raspberries in our neighbourhood. This left an abundance of raspberries, saved in our freezer, to complete this recipe.